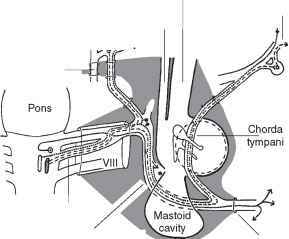 • From cerebellopontine angle, crosses posterior cranial fossa, enters internal acoustic meatus (IAM; with VIII). • Nervus intermedius joins main root of facial nerve in IAM. Fig. 11.1 Facial nerve (intracranial). VII at stylomastoid foramen branchiomotor fibres from facial motor nucleus to muscles of facial expression, stapedius, etc. ; §" * : parasympathetic preganglionic fibres from superior salivatory nucleus; Q—: nucleus of solitary tract receiving visceral sensory fibres, cell bodies in geniculate (sensory) ganglion; * to stapedius; stippled area represents bone. Fig. 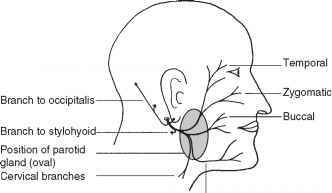 11.2 Facial nerve (extracranial). 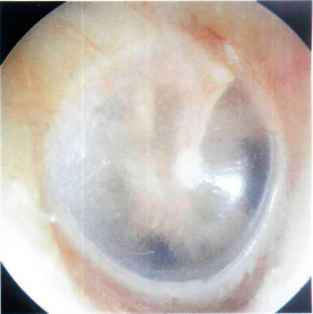 • Emerges at stylomastoid foramen. Where is the stylomastoid foramen?